Les pantoufles | One quality, the finest. 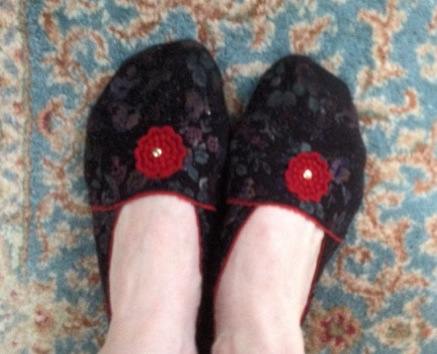 I love the French word for slippers, les pantoufles (lay pan-too-fluh). It has a sort of Dr. Seuss quality to it. Slippers were one of the first things I learned how to knit. They’re usually the first thing I put on in the morning and the last thing I take off at night. I own four different pairs. My favorite pair of pantoufles is one I picked up in Paris in a little boutique, Mi Amor (10 rue Pont Louis Philippe) in the Marais. They are lightweight and stretchy and sewn in a pretty print with a rosette on top. I like them so much I bought a bunch to give as gifts. After a few years of loyal service, the soles on my favorite pantoufles are wearing out. I sense a need to return to Paris. This entry was posted in French Vocabulary and tagged la pantoufle, mi amor, rue Pont Louis Philippe. Bookmark the permalink. One absolutely should travel to Paris for a new pair of pantoufles!